For many big-city dwellers, green spaces can be hard to find. Most residents don't have access to yards, and even sunny balconies are rare. The problem is magnified in industrial, inner-city communities — for many families, fresh, affordable and locally-grown produce is hard to access. However, a few determined gardeners are trying to change urban environments, one plant-filled lot at a time. The community garden movement attempts to bring more green spaces to cities, along with access to fresh produce. In communal gardens, city space is used to grow vegetables, fruits, herbs and ornamental plants, providing locals with beautiful areas and healthy food. New York City is no stranger to communal green spaces. Every year, more and more community gardens are planted in the city's vacant lots, schoolyards and rooftops. However, before we explore the different gardens tucked in corners around NYC, let's look at the details about community gardens, including their history, benefits and how to start planning your own. In essence, a community garden is any space that is gardened and cared for by a group of people. It can be on one connected piece of land, or it could take the shape of various shared plots on public or private property. Participants share in the maintenance of the garden, with tasks including keeping up paths, weeding beds and pruning or harvesting plants. Each community garden is unique. While one might focus on vegetables, another could emphasize lovely ornamental vines and flowers. The harvesting rules vary from garden to garden. In some community gardens, you can only take what you plant — if your neighbor has grown a crop of lovely heirloom tomatoes, you aren't free to harvest them without permission. However, in some gardens, all members of the immediate community are welcome to collect what they need. Any type of community can start a collaborative garden. Most often, community gardens are located in neighborhoods and schools, but they can also be connected to larger institutions such as hospitals, schools or assisted living facilities. Communal gardens exist to serve the specific needs of its community — for example, if one is attached to a school, its primary function is probably to supply fresh, healthy foods for the cafeteria. • Neighborhood gardens: When most people think of a community garden, a neighborhood garden is the image that comes to mind. A neighborhood garden is a space where residents of a neighborhood come together to cultivate vegetables, fruits and ornamentals. Neighborhoods can grow these gardens on either public or private land — if they are on public land, gardeners often rent individual plots for an annual fee. • Institutional gardens: Institutional community gardens are plots of land associated with private or public organizations, such as medical centers, schools and prisons. Institutions plant gardens because these green spaces offer a variety of benefits, including food production, teaching practical job skills and providing physical or mental rehabilitation. • Residential gardens: A smaller, more focused form of neighborhood gardens, residential community gardens are shared by the residents in assisted living facilities, apartment complexes and affordable housing units. • Demonstration gardens: Demonstration community gardens are designed for recreational and educational use. They are typically not the only garden in an area, and they often host tours and presentations to demonstrate the benefits of collaborative gardening. Community gardens are not a new idea. In the United States, they first popped up in Detroit during the economic recession of the 1890s. These "vacant lot gardens" were sponsored by the city, and they provided unemployed workers with empty plots of land to cultivate, along with any tools, seeds and instructions needed to start a garden. Detroit's community gardens helped to reduce some of the hunger, unemployment and poverty crises that plagued the city during the recession. Across the United States, other cities noticed. Community gardens began appearing throughout the country, from Philadelphia and Boston in the east to San Francisco in the west. Over the decades, vacant lot gardens evolved into various forms, including school gardens, wartime gardens, thrift gardens and victory gardens. Today, community gardens are often focused on helping the environment and revitalizing urban environments. • Provides access to fresh food: In many urban environments, it's almost impossible to find fresh and affordable produce. Communal gardens give industrial neighborhoods access to healthy, locally-grown fruits and vegetables, improving the health of the entire community. Additionally, many collaborative gardens also donate excess produce to local food pantries. • Encourages outdoor activity: The presence of a community garden encourages skill building and physical activity, drawing people outside and connecting them to their food and environment. They also create a peaceful setting where city dwellers can retreat from the noise and bustle of urban life, reducing stress. • Beautifies vacant and abandoned lots: Community gardens are an efficient way to turn vacant or abandoned lots into beautiful attractions, and they can revive old parks or green spaces. Some research suggests gardens even increase the property value of the whole neighborhood. • Helps the environment: Beyond producing oxygen, community gardens help absorb rainwater, reducing the high amounts of runoff that carry industrial pollutants into lakes and rivers. Communal gardens attract wildlife, providing a haven for birds and beneficial insects. Many collaborative gardeners utilize composting and recycling in their plots, too, producing their own fertilizers and reducing the overall waste of the community. • Revitalizes communities: Ongoing research suggests that the presence of communal gardens can improve the safety and social well-being of some neighborhoods. Collaborative gardens strengthen social connections across a neighborhood, and they give residents a sense of ownership and responsibility for their community. Community gardens bring life and beauty to a neighborhood. But the thought of starting your own can seem overwhelming — where do you even begin? Fortunately, creating a community garden is not as difficult as many people think. We've outlined seven broad steps to get you started, but before you begin, make sure you talk with someone in your local government — they will be able to provide insight into your area's specific laws and codes about communal gardens. 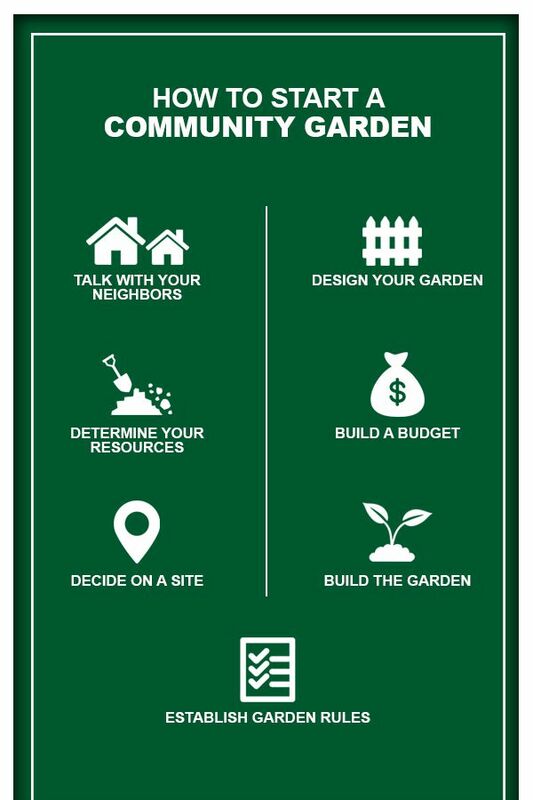 First, make sure you are talking with the people in your neighborhood about a communal garden. Gauge their responses — do they seem open and excited to the idea? Go to community groups and homeowners' and tenants' associations and get their opinion on the garden. Ask them what kind of garden would best suit the needs of your community — for example, discuss what types of plants would be best to grow. If the garden seems to have enough support from your neighborhood, ask the people who are most excited if they would consider joining a committee or group to manage the project. Once you have formed a group to help you plan the garden, begin identifying any existing resources that could help with the project. For example, your town might employ municipal planners who could help you find the best sites for your garden. Other essential resources include local gardeners or gardening clubs — experienced gardeners can provide expert knowledge into designing and building a successful garden. Try to find several sites that could work for your garden — you always want to have a sufficient backup if your first choice falls through. Contact the owners of the sites and ask if you can use the land. Let them know about the project and its benefits for the entire community, and offer to lease the land for a small fee. Once the owner gives their permission, the next step in the process is negotiating a lease. If possible, lease the land for at least three years — this will give your garden the best chance at success. Remember to include a waiver in the lease that protects the owner from liability if any accidents occur while someone tends the garden. Ultimately, your garden is a reflection of you and your community, so feel free to add as many additional elements as you like, from picnic tables to neighborhood bulletin boards. After you and your neighbors have decided on what you want to include in your garden, you can begin calculating expenses. According to some estimates, building a community garden generally costs between $2,500 and $5,000, although this will vary depending on each garden and neighborhood. There are many ways to fund your community garden, including membership dues, sponsors, grants and fundraisers. Talk with your community to find which method or methods work best for everyone. If you can't seem to raise enough funds, you can always scale back your plans — you can begin with a simple garden, and add extra features in a couple of years. Working with your neighborhood, organize teams to begin preparing the site for planting. Clear out any debris like rocks or trash, and set up an irrigation system. Clearly mark the locations of walkways and garden beds, and set up a fence around the perimeter of your property. Dig the beds if you are planning an in-ground garden. If you want container or raised beds, build them and place them in their designated sites. Add soil, compost and additional fertilizers as needed, and plant any shade or fruit trees. "Pave" paths with gravel or mulch for easy walkways. Before you begin gardening, you need to come up with the garden rules. Communicating any regulations on the front end ensures all gardeners and guests know what's expected of them. Work with the other gardeners to set the rules to make sure everyone is on board. Every garden is different and will have different rules. However, make sure you cover some broad topics such as funding, membership and maintenance. New York City is known for many things, from historic landmarks to world-famous food. But NYC is increasingly being recognized for its gardens. Over 600 community gardens dot the urban landscape of New York City, and every borough has dozens of thriving sites. 1. Community Gardens in the Bronx: The Bronx is filled with collaborative parks and gardens that encapsulate the indomitable Bronx spirit. Clean and lush vegetable gardens like the Jackson Forest Community Garden are a perfect place to grow your favorite produce. One of the largest gardens in NYC, the Morning Glory Community Garden has over 9,500 square feet of garden beds, picnic tables and border plantings. 2. Community Gardens in Brooklyn: It seems like Brooklyn has a community garden in every corner. From lush ornamental spaces like the Wyckoff-Bond Garden to the small vegetable plots of the Brownsville Green Community Garden, Brooklyn residents are dedicating more space to communal gardens every year. One of the latest additions is the Chestnut Street Community Garden, which features raised vegetable and flower beds along with several picnic tables. 3. Community Gardens in Manhattan: One of the largest and most beautiful community gardens in NYC sprawls in Manhattan's East Village. The 9th Street Garden contains over 40,000 square feet of breathtaking flowers, vibrant greenery, exotic trees and even a goldfish pond. Another hidden gem in Manhattan is the Creative Little Garden, which was first founded in 1978 and features a long, winding path through lush foliage. 4. Community Gardens in Queens: Many community gardens have less-than-lovely beginnings. The Two Coves Community Garden began as a development project for Goodwill Industries in 1998, but it was gradually transformed into a green paradise. For fresh produce, look no further than the Long Island City Roots Community Garden. A triumph of community effort, this garden has flower beds, a hard-surface patio with seating, a rainwater harvesting structure and various raised vegetable beds. 5. Community Gardens in Staten Island:West Brighton Community Garden was built as a part of the 2014 Gardens for Healthy Communities program, and with 9,000 square feet of raised beds and seating areas, it has quickly become a neighborhood fixture. At the Westervelt Community Garden, vegetable and herb plots mix with grilling equipment and community gatherings to create a beloved public space. Building a community garden benefits the entire neighborhood, but it can take months of hard work and planning before your site begins to really grow. To jumpstart your garden and give it the best chance of success, consider working with a professional landscaping service. At Dragonetti Brothers Landscaping, we are dedicated to helping you design and build a beautiful outdoor space. Our team will work closely with you to design a space that fits your budget and specifications, including hardscaping and lighting elements that will transform your garden into an urban paradise. 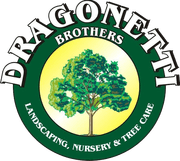 Let Dragonetti Brothers Landscaping help you make your dream garden a reality — call us at 718-451-1300 or contact us online for a free quote.